Kumamoto prefecture is very conveniently located, less than a two-hour drive from many of the other major cities in Kyushu, such as Fukuoka City. The prefecture is rich in history, with many popular tourist attractions such as Kumamoto Castle, built over 400 years ago and considered one of the three most magnificent castles in Japan. In addition, Kumamoto has an abundance of wonderful onsens (hot springs) such as the Kurokawa Spa. This resort is located by the Chikugo River and features several traditional Japanese-style inns with different kinds of open-air baths attached to each. Visitors can purchase a pass allowing access to all the open-air baths in the area. 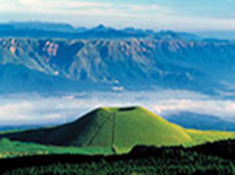 Another major attraction for visitors to Kumamoto is Mount Aso, one of the largest active volcanos in Japan, and at its peak of 1592 metres above sea level, has one the largest calderas in the world. Kumamoto is also renowned for the Amakusa coastal area. 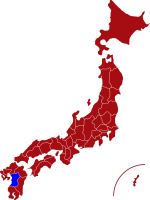 The Amakusa islands are linked to mainland Kyushu by five bridges, known as “The Pearl Line”. 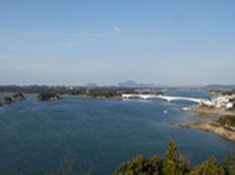 The picturesque view of Amakusa Matsushima Island, which replicates a miniature landscape garden, can only be truly appreciated from any of these bridges. For more information about Kumamoto prefecture, see their official tourism website. Air - Kumamoto Airport is situated 22km from the city centre and takes around an hour to reach by the Airport Limousine Bus. The airport operates daily flights to and from Tokyo, Osaka, Nagoya and Okinawa. Click here for its English website. 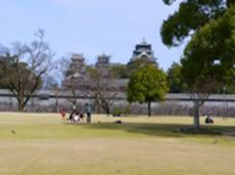 Kumamoto Castle is one of the three most famous castles in Japan. The original castle, dating back to the 17th century, was built for the legendry samurai warrior, Kiyomasa Kato, and took almost seven years to complete. Amakusa comprises of more than 120 islands of various shapes and sizes. It is a popular destination for its picturesque location and scenic beauty. The location was a hideaway for Japanese Christians during the Edo period when Christianity was still banned in Japan. Mt. Aso, also known as “The Land of Fire”, is considered to be the symbol of Kumamoto. The crater, which measures 18 kilometres from east to west and 24 kilometres from north to south, is the one of the world's largest calderas. Dolphin watching - There are more than 200 species of wild dolphin living in the sea surrounding Tsushishima Island in Amakusa. 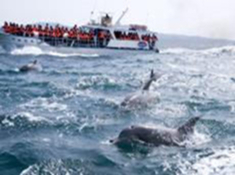 Boat excursions around the Amakusa Islands operate throughout the year to see the dolphins in their natural habitat.